On the hill of Göbekli Tepe, stone pillars stand tall against the Turkish summer sky. People first came here more than 11.000 years ago. These men and women, who lived as hunters and gatherers, achieved a great deal with very little. Without metal tools, the highly skilled artisans of Göbekli Tepe carved the T-shaped pillars from the local limestone. These pillars – some of which were up to 5.5 metres high and weighed several tons – then found their way from the nearby quarry to the site, where the communities incorporated them into round-oval, semi-subterranean stone buildings. Fox, crane, boar, snake and scorpion arise from the light-coloured stone, leaving a vivid testimony of Neolithic art. For thousands of years, the monumental structures were forgotten, covered by a mound of earth and rubble. However, in 1994 researcher Klaus Schmidt recognised the importance of the place. 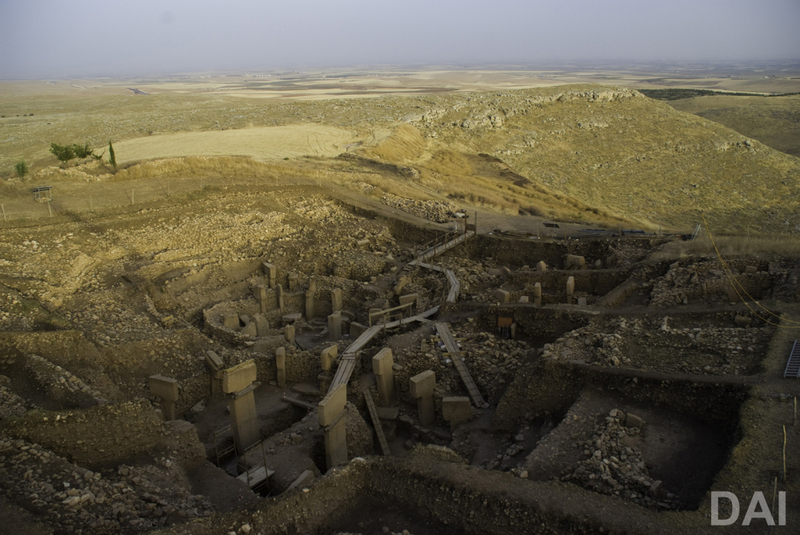 A Turkish-German collaboration of archaeologists undertook first excavations at Göbekli Tepe. Today, the stone buildings still stand where they were once erected – in the hilly landscape of south-eastern Turkey. 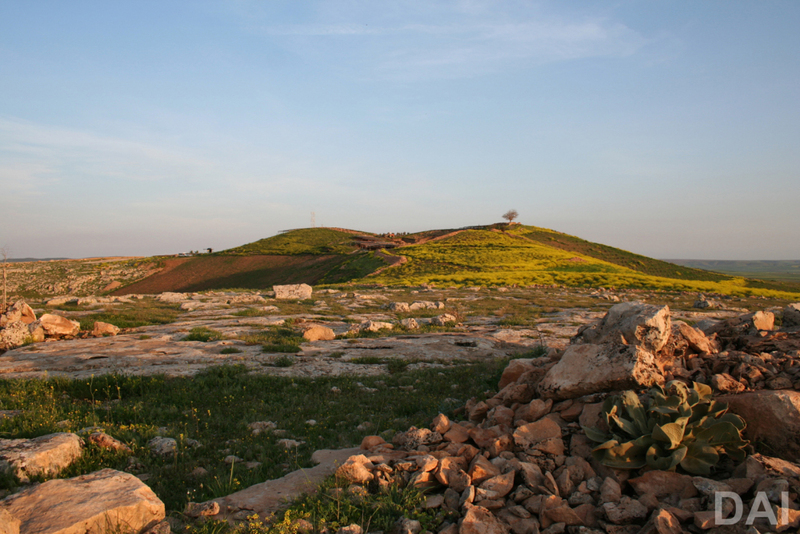 The mound of Göbekli Tepe. View from south | © Schmidt, DAI. In a climatised hall in Bahrain, archaeologist Dr Lee Clare of the German Archaeological Institute awaits the verdict of the UNESCO World Heritage Committee. Every year the Committee selects the sites to be included in the World Heritage List. In 2018 the representatives from 21 State Parties meet for the 42nd time. Dr Clare coordinates the international team of archaeologists that investigate Göbekli Tepe and has worked together with the State Party of Turkey on the application process. Over the past two decades, research at Göbekli Tepe has seen the successful collaboration of German archaeologists with the Turkish authorities, first and foremost the General Directorate of Cultural Heritage and Museums, Ministry of Culture and Tourism of Turkey and the Şanlıurfa Museum. Current research at the site is undertaken in the frame of a DFG [Deutsche Forschungsgemeinschaft] long-term funding project. “We’re extremely pleased that we can make an active contribution to the Turkish UNESCO nomination of Göbekli Tepe. The significance of the site for our understanding of the Neolithic transition in this key area of the Fertile Crescent can’t be stressed enough,” says Lee Clare. Dr Clare knows that it is a long process to build a good case that stands up to scrutiny. The ‘Outstanding Universal Value’ of a cultural heritage site must be recognisable. A convincing management plan is also one of the criteria of the UNESCO. World Heritage Committee. During the last 20 years, the team of archaeologists has carefully uncovered just enough of Göbekli Tepe to gain an insight into the possible functions of the site and its significance for contemporaneous hunter-gatherer communities. Two permanent shelters now protect the Neolithic T-pillars, walls and terrazzo floors from wind and weather. The aim of the archaeologists is not only to gain a better understanding of the past but to preserve the site for future generations. Left: Pillar 56 from Göbekli Tepe’s Enclosure H. | © Becker, DAI) Right: Detail of Pillar 27 in Enclosure C: high relief of a snarling predator | © Johannes, DAI. 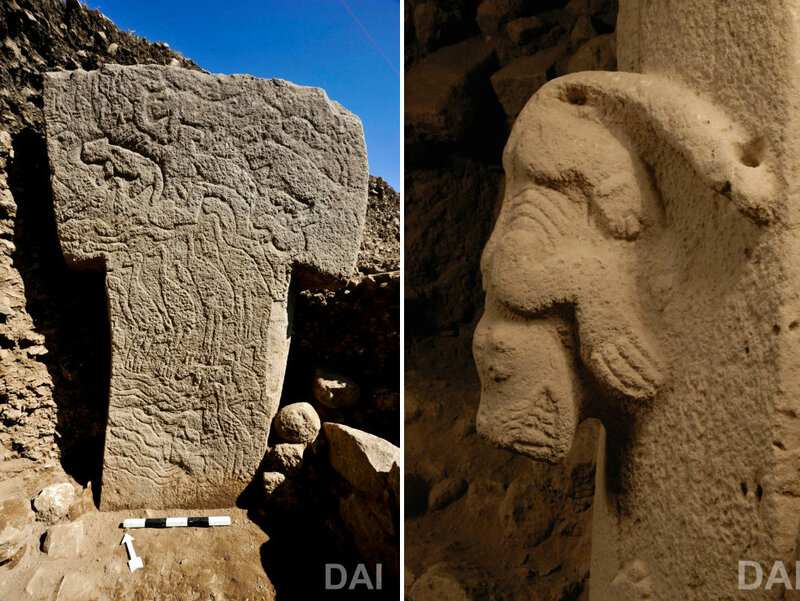 The efforts first paid out in 2011, when UNESCO included Göbekli Tepe in the World Heritage Tentative List. Now it will be decided if the application of the Turkish State Party is successful. A site benefits from the World Heritage status in various ways. The prestige often helps raise awareness for heritage preservation, resulting in a higher level of protection and conservation at the site. The State Party of Turkey might also receive financial and consulting assistance from UNESCO to support activities for the preservation of Göbekli Tepe. “When Klaus Schmidt initiated excavations at Göbekli Tepe in the mid-1990s, there was practically no indication of the significance that this site held for us and future generations. The OUV [outstanding universal value] of Göbekli Tepe is undisputed. But it’s not only an important site for us archaeologists. It’s a crucial site in World history, and its inscription on the World Heritage List will underline this fact”. What has been evident to archaeologists and thousands of visitors to the site for a long time is now official: Göbekli Tepe is of outstanding universal value to the shared cultural heritage of all people. Image: View of Göbekli Tepe’s so-called main excavation area, Enclosure D in the front | © Becker, DAI.